This is an unmaintained trail with scrambles.... much of the way with no trail at all. DO NOT ATTEMPT THIS HIKE UNLESS YOU ARE ENTIRELY EQUIPPED AND EXPERIENCED FOR SUCH AN ADVENTURE. Here is another fantastic gem located with the Yakima Indian Reservation. Remember, a pass is required and can be purchased along the road to Bench Lake. At about 1/4 mile the trail drops steeply and crosses Hellroaring Creek on a newly constructed bridge. The trail begins to climb, but junctions shortly after the bridge. Bear left and begin the steep climb to the crest of the ridge. At about 1.3 miles the trail passes a clearly visible trail marker and it is at this point that I recommend a cross-country scramble following the ridge line above you. Little Mt Adams is in sight almost all the time, so it is not difficult to scramble your way below the ridge you are following to the base of the mountain. When you reach the base on the north side you will see a trail that others have used to reach the summit. Be sure to drop down into the crater itself and look around for great vistas of Bench Lake, Heart Lake, and of course Hellroaring Canyon and the gorgeous Mt Adams which looms over you. 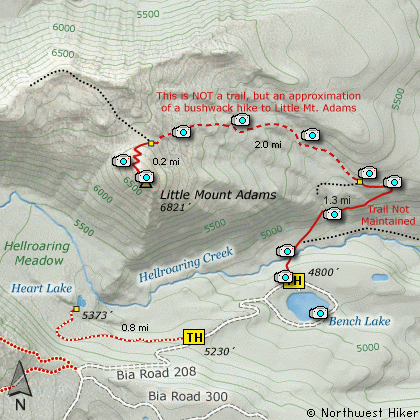 A challenging return option is to descend into Hellroaring canyon to the west of Little Mt Adams, and cross the swampy meadows to Heart Lake. Finding Heart Lake is a bit of a challenge, but just remember, to keep from getting lost, there is an excellent trail along the south side of Hellroaring Meadow, so if you can't find the lake, just walk south across the meadow until to intersect the trail that you can follow east back to the road which you took to Bench Lake. Bear right and forward onto Mt. Adams Road for about 1.3 miles and you come to the junction with Forest Road 23. Bear right and continue on Mt. Adams Road, which is also Forest Road 82, for another half mile or so, and when you come to Forest Road 80, bear again to the right and stay on FR82. To reach the Bird Creek Meadows area, just stay on FR82 for another 8.3 miles past FR80. At this point, FR82 turns into the Bureau of Indian Affairs Road 285 as well as FR8290. Continue on BIA285 for another 4.2 miles and you will come to Mirror Lake and the junction of BIA304 which takes you to Bird Lake. Continue another mile and you will pass the parking area	and trailhead for Bird Creek Meadows on your left. BIA 208 now becomes extremely challenging, and heads down a steep rough grade for about a mile and a half to the entrance of the Bench Lake camping area. The road may be a one-way drive, so bear to your right and drive around the lake to the obvious trailhead parking area on the north side of the lake. As you drive around the lake, be sure to stop for a moment and walk down to the lake and enjoy the incredible view of Mt. Adams and Little Mt. Adams as seen from the lake.